And now, the best use of that “Super Powers” logo ever. 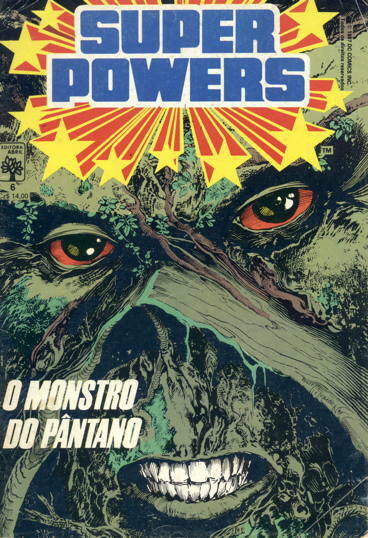 That is Super Powers #6, a digest-sized comic published in Portugal in 1987. It reprints, in color, issues #29-#31 of Saga of the Swamp Thing from 1984, comprising Alan Moore, Steve Bissette, John Totleben, and Rick Veitch’s Arcane trilogy. Leaves out the annual that wraps up the storyline, however. That wasn’t bad, I thought. (And before you ask, no, it’s not autographed…that signature is printed on the page. It’s a squarebound book, presenting the first four issues (and cover images) of the Scott Snyder/Yanick Paquette/et al. series, on nice slick paper with no ads (except some house ads inside the covers). It’s 48 pages, staplebound, also adless save for house ads and a couple of pages of editorial matter at the back. 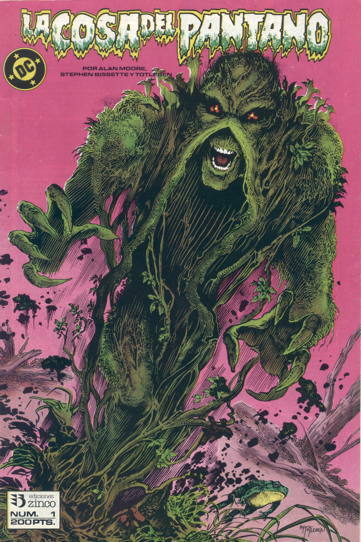 It reprints Saga of the Swamp Thing #21 (1984), with Moore, Bissette and Totleben’s revision of Swampy’s origin, followed by the first chapter of the Nukeface story from issue #35 (1985). There’s also a Marv Wolfman/Don Newton Vigilante story in there, too. An interesting mix of material, I thought. Also of note, there’s a one-page of biography for Batman’s cocreator Bob Kane…and another biography on the facing page for the usually-overlooked Bill Finger. …also featuring Sub-Mariner and Rom. Also: “Rom the Space Knight” is okay, “Rom, o Cavaleiro do Espaço” is fantástico. Anyway, a big thanks to John P. for sending these my way. They’re great, and I really appreciate them! The Swamp Thing Shrine grows ever larger. 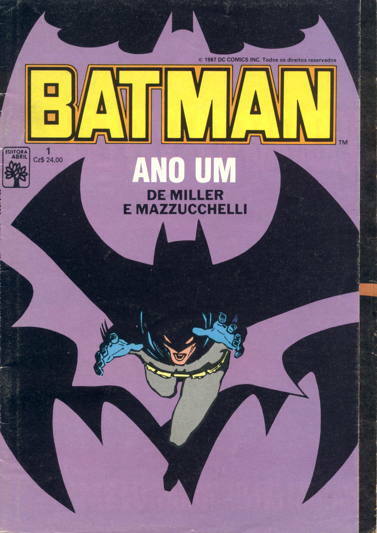 Just a quick correction, those comics in Portuguese were actually published in Brazil, not Portugal, we just imported them from there back in the day. And yeah, those digests had such a weird mix of comics sometimes, made for a lot of eclectic fans in both countries! Seeing these got me thinking about Swamp Thing’s teeth. What are they made of? Does he ever use them, or are they just for looks? How does he keep them so white? Mike, I think I’m gonna need an extensive article about Swamp Thing’s teeth. 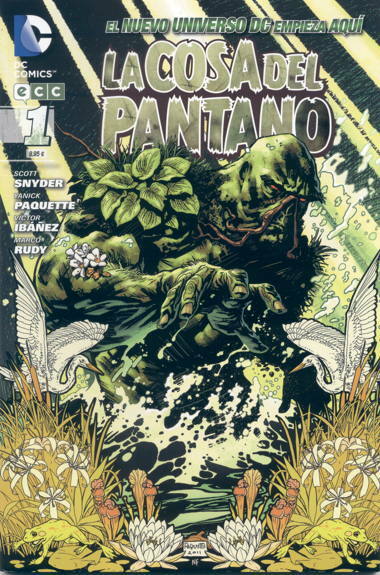 If you say it in a deep spooky voice,”La Cosa Del Pantano” sounds way more badass than “Swamp Thing”. There’s one of those “reliable rumours” going around that Snyder is leaving Swampy to work on his new Superman series.Can’t blame him,I guess,but I was hoping to see more than one storyline from him.Twenty issues of Rot and he’s gone.Ah,well.Wouldn’t it be sweet if they replaced him with Len Wein?And then got Wrightson to do the Annual?I’m getting too worked up again.Sorry.Time for a relaxing mudbath. 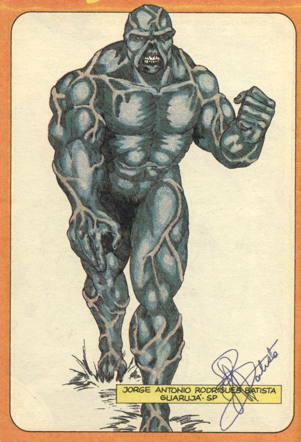 I think Swamp Thing should wear that Super Powers emblem on his forehead all the time. It suits him. 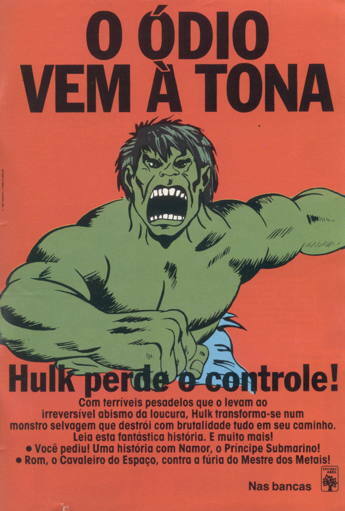 The translation of the Hulk ad is spot on, the issue in question is a reprint of Hulk #300, so you can see how his rage coming back is an special event. So in that Super Powers #6, Abby dies at the end. End of story. What a bummer. What does that translate to, “The Thing of the Swamp”…? How interesting ! I had no idea those digests were printed in Brazil. Glad you enjoyed all the items,Mike and it was nice to see them highlighted here.